The iPad's built-in Calendar app may appear simple, but it is hiding some very powerful features. Not only will the Calendar help you organize your events, meetings, appointments and social engagements, it can send you reminders with current traffic conditions included. It is also a universal calendar. This means it can work with other calendars, including Google Calendar, Yahoo Calendar and third-party calendar apps found on the App Store. This versatility is why it is important to learn how to use the iPad Calendar app. Checking your calendar may seem pretty clear cut. Tap on the app icon. View your calendar. But there are a few tricks you should know to get the most out of the iPad's built-in calendar. You can always hunt through page after page of app icons, but there are two quick ways of launching any app on your iPad. Siri is the fastest way to launch any app, including the Calendar. Simply hold down the Home Button to activate Siri and say, "Open Calendar." Don't like talking to your tablet? Spotlight Search is also a quick way to open apps without the need to scroll through screen after screen. Slide a finger down on any empty space on the Home Screen, which is the screen with all of the app icons. This opens Spotlight Search. Start typing "Calendar" and tap on the app icon when it appears. Just want to see your next meeting? There's no need to open the Calendar app just to check your schedule. Again, Siri is your friend. "Show me my schedule" will display all of your appointments for the day. You can also modify this with a date. Try: "Show me my schedule for Wednesday." The iPad also has a "Today View" screen that can be accessed by swiping from the left side of the screen toward the right side of the screen while on the very first page of apps. The Today View will show you an "UP NEXT" window with your next meeting or appointment. Tapping this window will take you to the event in the Calendar app. The Today View is also accessible while your iPad is locked, so you don't need to unlock your iPad to check your next meeting. You will need to unlock your iPad to view your full calendar even if you tap the event from this screen. Don't want your calendar events accessible from the lock screen? Launch the iPad Settings app, choose Touch ID & Password from the left-side menu and tap the on/off switch next to Today View. You can also turn off Siri, Notifications and other features from the lock screen. By now it probably won't surprise you to learn there are multiple ways to create an event on your schedule. You can also add a location, notes and even a website to an event. The location is important if you want to receive traffic conditions alongside your appointment. Siri is the quickest way to schedule an event. "Schedule a two hour meeting titled Conference Call for Tomorrow at 3 PM." Note that you can specify the duration and the title as well as the date and time. After scheduling the event, you can tap the calendar window Siri shows you as confirmation to go straight to the event in the Calendar app. In the Calendar app, you can add a new event by pressing your finger on the day of the meeting. Your finger will need to be pressed against an empty area of the day box. This has the advantage of filling in the proper date. You can also tap the plus symbol (+) in the upper-right corner of the screen to add a blank event. You will need to set the date and time manually. Schedule the event to repeat every day, week, 2 weeks, month, year or custom interval by tapping Repeat. Choose Alert to be sent a reminder on the day of the event, one day before the event, two days before the event or one week prior to the event. At the bottom of the edit screen are input boxes for URL, which is the web address you want to store with the event, and a Notes field. Do you want to change the default calendar used for events? Launch the Settings app, choose Calendar from the left-side menu and tap Default Calendar for a list of available calendars (Google, Yahoo, etc.). The ability to connect your calendar from Google, Yahoo or other third-parties with your iPad calendar is what makes the built-in app the best calendar app on the iPad. And it is very easy to link your external calendar, especially if you already have your account set up on your iPad. 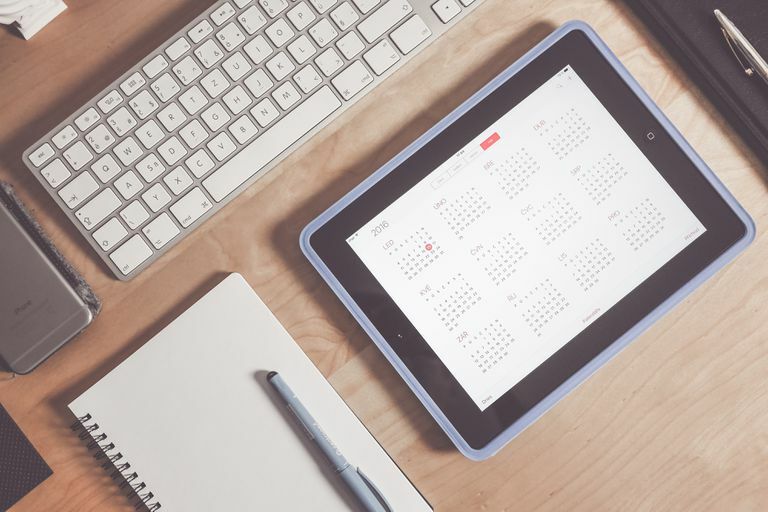 These calendars will sync almost instantaneously, so as soon as you add a meeting on your Google calendar, you should see it on your iPad calendar. First, launch the Settings app on your iPad. Scroll down the left-side menu and choose Passwords & Accounts. If you have already set up the account on your iPad, tap the account name and then flip the on/off switch next to Calendars to on. If you haven't set up the account, tap the service you'd like to add, like Google, Yahoo!, or Exchange. You will be taken to the host's website will you need to login to your account. After you log into your account, the calendar option should be turned on by default.